I was first introduced to the local bakery and coffee shop called ‘Through the Looking Glass’ on Koh Tao by an acquaintance I’d met while volunteering for ‘Trash Hero’ (a volunteer group that got together weekly to pick up trash on the island and beaches). After one particular volunteer session, the fellow volunteer suggested we get some lunch, so we wandered into ‘Through the Looking Glass’ for a nibble. While I honestly wasn’t very hungry at the time, I soon discovered why the little bakery was a local favorite. Their coffee was REAL (fresh ground!!! ); all the breads and baked goods served were made and baked FRESH on the premises (seriously, finding baked bread is a treat all by itself in Thailand, but to also find cakes, brownies and other goodies??? Pinch me now!! ); and their chicken, bacon & mayo sandwich was to die for!!! Though I didn’t know anyone there (except the fellow Trash Hero volunteer) it was easy to see (apart from the delicious food and coffee) why this place was so popular. Everyone said hello to one another whether they knew them or not. The owners (Deb and Rick) engaged with customers and treated everyone as good friends. The location itself (being off one of the main roads in Sairee) was a delightful spot for people watching. And best of all, everyone was greeted by Am. Am was once a street dog who adopted Deb and Rick. While she stays true to her street dog nature by bounding off and visiting her street dog friends daily, she also enjoys the loving attention and care of her adopted owners. Perhaps it was a week or two that had passed since first popping in for a bite at the Looking Glass when I got to thinking that I needed a routine. When staying in one place for a while, it’s important to develop a good routine that also gets you out and about. So far my only real routine had been to go to Muay Thai training but then after I’d want to chill out the rest of the day at home and would find myself not engaging with the outside world so much. So I decided I needed to inject a social routine, and the Looking Glass was the only place that popped to mind when thinking just how to get it done. The new routine went as such: Muay Thai training in the morning, home, shower and then to the Looking Glass for coffee. It was no time at all before I practically knew every person on the island! As I chilled out at the Looking Glass consuming (admittedly) a ridiculous amount of coffee (up to 6 cups a day, but on average only 4) I met numerous new people, got caught up on all the goings-on of the island, spoiled Am with lots of loving, and chatted with Deb and Rick whom I grew to consider as family. For the rest of my time on Koh Tao (over a month) not a single day passed that I didn’t stop by for a visit (except for their day off). It was quite a bitter-sweet moment when it came time to leave the island. Once Anna arrived, while we did spent another 10 days or so exploring Koh Tao together and enjoying daily coffees and sandwiches at The Looking Glass, it was time to move on and explore more islands of Thailand. For our last night on the island we went out with Deb and Rick to A Taste of Home (delicious German food and homemade Bailey’s!!) and drank and ate and laughed until the wee hours of the morning. I miss Deb, Rick and Am terribly but am blessed to have known then at all. It’s friends like them that you meet along the way that make traveling all that much more special! Two things I noticed specifically in Manizales: #1 the HUGE amount of candy, cake, bakery, sweet shops, and ice cream shops!! Literally every other store had something to do with selling a sugar based treat to eat. I’d never seen so many sweet shops in such a small amount of space. And what stores, you may ask, were in between each of the sweet shops? Well, that would be #2, the SHOE shops!! Manizales would definitely be the dream place for any shoe enthusiast. From boots to heels to stilettos, Manizales had every shoe possible and catered quite strongly to women. The amazing thing to me was that the majority of women were wearing stiletto heels and walked the streets as if walking down the red carpet or a runway!! I mean they worked it and made it look so natural and easy! Now, I myself have been known to rock a heel shoe, but what made the Colombian women wearing stilettos so impressive is the quality of the roads!! They were walking in stilettos as if the roads and sidewalks were perfectly paved without a hint of a defect anywhere. The reality however was far from this as the roads and side walks left quite a lot to be desired! And many of the little roads were made of brick, so the spaces in between each brick…. I’ve no idea how they didn’t break their ankles on a regular basis! 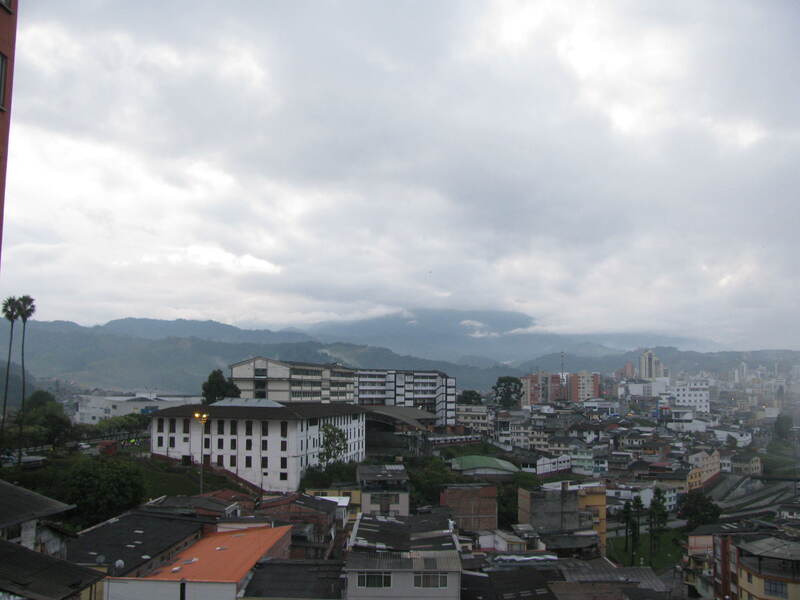 Anyway, I stayed in Manizales for only a couple of days. And honestly, because of the weather mainly (I’m seriously a wimp in cold weather) I was just uninspired to do anything! Not to say there wasn’t anything to do in Manizales, but the cold just made me want to curl up with a blanket and a little fire. Plus, I was still trying to make sure that I got to Bogota in plenty of time to see my brother, so that too cut my time there to just a few days. Had I had more time to explore that are however, I would have absolutely (and I do plan to still check this area out) gone to the coffee region of Colombia, one of the more famous spots: Armenia. I’ve heard a lot about this area from fellow travelers and from some who are from the area and have heard of nothing but fabulous reviews. Perhaps once I get there I will have found a spot in Colombia with awesome coffee and where they drink it not only at breakfast;) Seriously, it was shocking to me how unimpressed I was by coffee in the areas I did travel of Colombia. It was as if they saved the best coffee to be exported elsewhere or something, lol! !